School was back in full swing across the county with big yellow buses, crossing guards and football games. Even though summer was way too short, I was ready for fourth grade at McKenzie in September 1952. I knew nearly all my classmates, the nooks and crannies of the old brick building, and I actually looked forward to learning new stuff. School went fine for the first few weeks but gradually I figured out that my teacher didn’t like me. She didn’t call on me, she picked on me. She didn’t correct me, she criticized me, and I couldn’t understand why. I managed to stay under her radar by doing my work as quickly and quietly as possible and daydreaming the rest of the time. Things came to a head one day with a vocabulary drill. My desk was away from the windows, half-way back on the hall-side row. She started on the other side of the class, requiring each row of students to make a new sentence with the designated word. To make matters worse, she walked between the rows and faced the kid whose turn it was, tapping her pencil against the pages of her grade book as she waited. If he came up with an acceptable sentence (no matter how dumb it sounded to me), she’d check off his name and step to the next desk. Borrrrrrringggggg. Off my mind drifted into a chapter of my latest Nancy Drew library book. Suddenly I felt her presence — it was my turn. I looked up, and there she stood with her grade book. My mind completely blank, all I could see was her scowl and all I could hear was the tap-tap-tap of her pencil. I couldn’t remember what the vocabulary word was, much less how to make a sentence with it. I had paid attention for the first row of kids, sort of half attention to the second row, but since then my mind had been many places, none of them this classroom! “We’re waiting, Betty,” she said. My face grew hot, my tongue seemed to get tangled up in my mouth and I couldn’t get any word out, much less the vocabulary word. After another moment, she proclaimed in exasperation, “You could have repeated the sentence the last student gave.” I could have? If only I’d been listening! Shaking her head, she hooked her finger and pointed me out of my desk and onto a straight-back chair in the hall. It seemed like forever that I sat there, thinking how I never wanted to enter that room again and face the smirks of the other students. Betty’s daydreaming again, ha-ha-ha. But only a few minutes later she motioned me back inside the room and the day went on as if nothing had happened. I did my utmost to never let her get the best of me again. In spite of my terrible lapse that day some good things happened in fourth grade. Our class learned an Irish jig and an old fashioned square dance, demonstrating our new abilities to the whole school on stage in an assembly program. The girls showed off our frilly dresses and slips, Mary Jane shoes and lacy socks, the boys looked spiffy in their look-alike pants and shirts, and we had a blast. It was a pretty good year except for that miserable vocabulary drill, in spite of the teacher keeping an eagle eye on me the whole time for some strange reason. I wish I’d known she thought so the day of that dreadful vocabulary drill. I thought she didn’t like me, maybe even hated me — but she was trying to challenge me, to rein in my overactive imagination. She didn’t totally succeed in doing that, but she did make me pay attention and work harder in class. As I read that little note several times, my attitude toward her changed from resentment to gratitude. This is way overdue, but Thank you, Mrs. Reynolds. “Duz does everything.” Remember Duz? Duz laundry detergent got out all kinds of dirt and stains. But just in case you didn’t really believe that, in the 1940’s and 50’s you could furnish your kitchen with good old Duz. Goblets and dinner plates, flatware and dish towels all came free with Duz laundry detergent. You might get a little pasteboard box containing a teacup in your Duz this week, assuring you’d buy more to get the saucer next week. I don’t remember how well it cleaned the laundry but Duz did one thing well, it sure sold laundry detergent! Perk-a perk-a perk perk, a perka perk perk… can’t you smell the “good to the last drop” Maxwell House percolating? The perky commercial stuck in your mind and when you hit the grocery store, why naturally you had to buy a bag. The last time I used a percolater it was to heat water for instant coffee. Boy, my days sure are different now. For several months in the late 1940’s my family occupied an upstairs apartment in a big two-story house on West Palmetto Street. One memorable summer morning I wandered around indoors looking for something interesting to do. I had already cut out all my paper dolls, read all my comic books and colored all my coloring book. Etta (our housekeeper/babysitter) was in the kitchen ironing the Duz-fresh laundry, sipping Maxwell House coffee and listening to Don McNeil’s Breakfast Club on the radio. Harold occupied himself with his Lionel trains or something. I couldn’t jump rope indoors. Couldn’t play hop-skotch indoors. Needed more girls to play jacks. What to do? 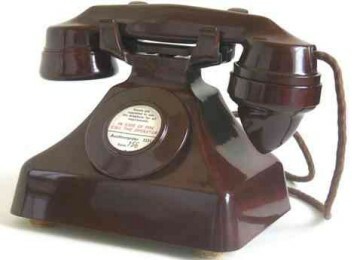 Making my way into the living room I spied that remarkable gadget, our very first telephone. Heavy and bulky, there was no dial, just a smooth black surface. Hmm. My curiosity getting the best of me, I raised the receiver to my ear to see what it sounded like in there. A lady’s voice demanded “Number please.” Startled, I was afraid to hang up — the woman in the phone might know where I lived! But I didn’t know any telephone numbers, not even our own, so, quick-thinking me asked for my mother’s office. The kindly telephone operator looked up the number and said, “I’ll connect you now.” And she did. Of course I got a good talking-to since the phone was strictly off-limits except in an emergency, and “What time are you coming home?” wasn’t exactly an emergency. I explained as best I could that it was all a terrible misunderstanding, but I had a feeling there would be another talking-to when mama did come home. I went into the kitchen, opened the icebox and took down a bottle of milk. The block of ice in the box was nearly melted but the milk was still cold. Etta hummed along with the radio, her squirt bottle going “swhush swhush” as she dampened a shirt for ironing. I dunked a cookie in my milk and pondered what to do with the rest of the morning that wouldn’t get me into trouble. Well, dress-up was always fun. I made a beeline for mama and daddy’s bedroom. I carefully lifted the lid of mama’s jewelry box and listened to the little tune, then fingered through the dainty necklaces and earrings. Selecting several mismatched drop sapphire earrings, I carefully screwed them onto my lobes. Those orphan earrings now reside in my own jewelry box; I’ve never been able to part with them. I scrounged around in the closet for articles I figured mama wouldn’t wear again, then lugged my makeshift wardrobe into the living room. Onto my skinny shins I pulled run-filled stockings, sliding round garters up my legs to keep the baggy hose in place. It was a lost cause; they kept creeping down and I had to keep yanking them back up. I added a crinkly crinoline to my ensemble, adjusting the waist with a safety pin. A gold knit top came next, picked and pilled with a few runs in it too, but I loved it. I carefully hitched up a black felt skirt over the crinoline. Knee-length on mama, it was evening dress length on me. I cinched a wide elastic belt in place to fasten everything and knew I looked glamorous. Next I perched a black straw pillbox atop my head, untangling the veil and pulling it down. By the time I got all that netting straightened out it stretched nearly to my chin. Oh well, more glamor! Finally I slipped my toes into a pair of mama’s high heels. Clinging to the sofa, I rose to my wobbly feet and attempted to strut across the living room. I soon discovered I needed a bit more padding in a few strategic spots, including my feet. Maneuvering in those slippers proved to be a real drag, especially when I had to yank my stockings back up every minute or so. I didn’t care. I was Marlene Dietrich to my heart’s content that morning. In spite of my telephone misadventure I had a lot of fun that day, mostly with stuff that doesn’t exist any more. Of course, I do still have two Duz goblets (acquired when doing my own laundry many years later) and the orphan screw-on sapphire earbobs. They might be worth a lot on E-bay these days, but they’re worth a lot more in memories to me.